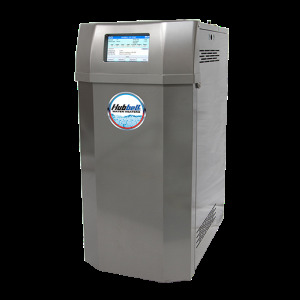 The Hubbell NX is a heavy-duty, fully condensing commercial gas water heater coupled with a long lasting cement lined Hubbell storage tank creates a full turn-key water heating system. The Hubbell NX is a heavy-duty, fully condensing commercial gas water heater coupled with a long lasting cement lined Hubbell storage tank creates a full turn-key water heating system. The Hubbell design achieves a rated thermal efficiency of 96% and is available with inputs ranging from 200 - 800 MBH. The NX series integrates the best of both worlds by combining a high efficiency, high recovery gas water heater with a properly sized cement lined storage tank, reducing energy consumption, short-cycling and stand-by heat loss..